The Geneva Environment Network and the United Nations Environment Programme, in association with the Right Livelihood Award, the Universal Rights Group and the Permanent Mission of Switzerland to the UN in Geneva, held a roundtable discussion with Award winning environmental and human rights activists working at the frontlines in different countries to discuss the threats, challenges and opportunities they face. Environmental human rights defenders (EHRDs) are facing heightened risk and challenges in their environmental activism, in every region of the world. They are subject to killings, detention, threats, intimidation, stigma and criminalization from State and non-State actors (Source OHCHR). Every week, on average, two environmental and land rights activists are killed and the numbers are getting worse, according to the international NGO Global Witness. In March 2016, the Human Rights Council adopted a resolution which requires States to ensure the rights and safety of human rights defenders. 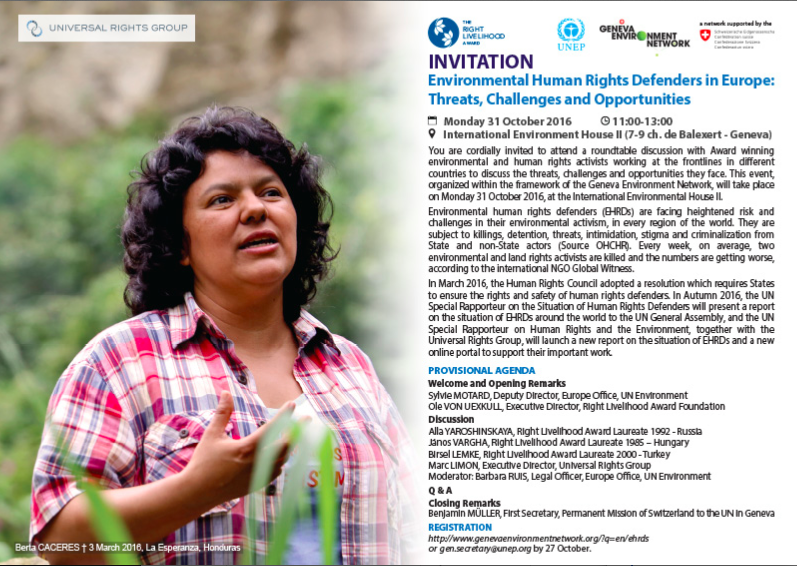 In Autumn 2016, the UN Special Rapporteur on the Situation of Human Rights Defenders will present a report on the situation of EHRDs around the world to the UN General Assembly, and the UN Special Rapporteur on Human Rights and the Environment, together with the Universal Rights Group, will launch a new report on the situation of EHRDs and a new online portal to support their important work.